It’s hard to focus on forward-looking growth strategies when you’re wasting time wading through project updates in your inbox. Our processes just weren’t scalable – and it was impacting the scalability of our organization as a whole. I realized we were just wasting time. With five brands operating under the parent company, this coffee chain has grown to be one of the largest in the US. Yet with tremendous growth come growing pains for departments like the Operational Strategy and Execution group. Reporting to the Chief Operations Officer, the team drives initiatives that impact retail locations across all brands in the company’s portfolio. Today, every program or initiative that impacts field operations must first pass through the Operations Strategy and Execution group. This process has successfully reduced field turnover and improved execution of corporate, operational, and strategic initiatives. However, while achieving growth, success, and increased visibility, the team faced a new set of challenges. Because the company is growing multiple brands, it faces a significant volume of both large and small initiatives. In the beginning, the team tracked projects in Microsoft Excel and PowerPoint. In managing substantial growth across operations, the team needed increased visibility across initiatives, organization-wide. The Senior Director of Operational Strategy and Execution needed a simple way to get an overview of the status of each high-level initiative, deadlines, and milestones, as well as each team member’s workload that Excel wasn’t providing. AchieveIt gave this company the one one source of truth they needed that gave visibility, insights, and clarity at a glance. They can now access not only key metrics, but also the context that goes along with them. AchieveIt helps them streamline the data collection and reporting process, which helps employees spend more time on execution. The team has since been able to cut our time spent tracking down to a quarter of what it used to be, which has freed up a lot of time across the team. Without spending hours fitting data into manual, standardized reporting formats, AchieveIt has saved the organization 1500 hours a year in tracking and monitoring their operational growth plans. 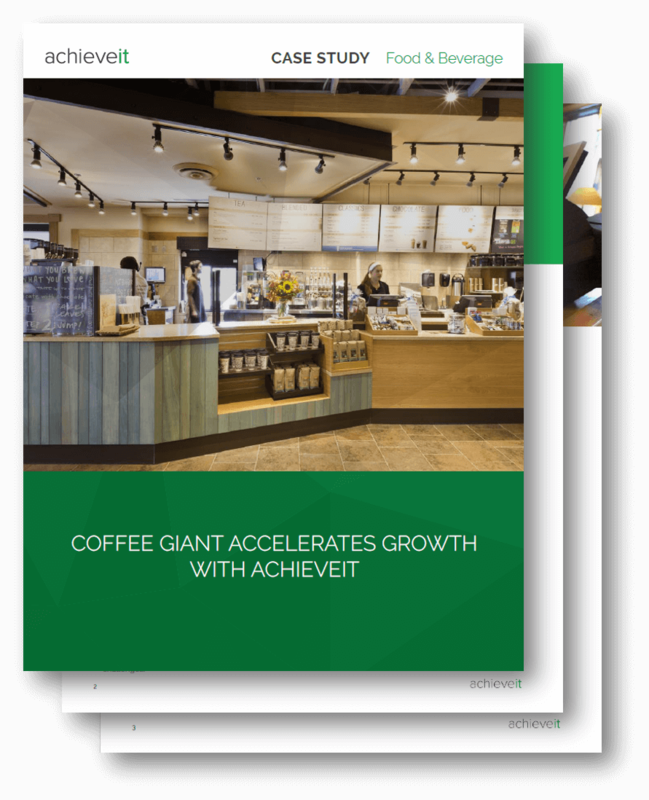 Read how this fast growing company coffee giant increased visibility into the status of its operations, executed faster with better informed decisions, and increased the speed and accuracy of reporting.